Need a good quality monocular to give you an HD viewpoint at a distance? Look no further than the Bushnell Legend Ultra HD Monocular for your next hunting trip. The Bushnell Legend is a great choice for spotting wildlife, for identifying distant detail and for getting even more success from your next hunting trip. This Bushnell Monocular is made to the highest specifications and comes with all you need to get started, but is it good value for money? Let’s take a closer look at its features, it’s benefits and any disadvantages that come with buying this product so that you can make an informed purchasing decision when you’re choosing the right model for you. One of the best things about the Bushnell Legend Ultra HD monocular is that it comes complete in its box with all you need to get up and running. The monocular itself is a 10x glass piece with an objective lens of 42mm and, since it has been designed with tactical use and excellent ergonomics in mind, you can be confident that it’s comfortable and easy to use. It also comes complete with a Picatinny rail on which you can mount accessories and since it’s also tripod compatible, you’ll have complete flexibility about how to use this monocular. When you open the packaging, you’ll see that you also receive a strap and a useful carrying case, so it couldn’t be safer or easier to transport this monocular wherever you want to go. Since the tripod mount has actually been built into the body of the monocular itself, you won’t need to carry an adapter around, although the socket can be removed for easier carrying if you choose. Although the inclusive carrying case is a little large, it’s very useful for storage between uses while the removable belt clip makes it a breeze to hit the trail with your monocular close at hand. The Bushnell Legend Ultra HD monocular gives you 10x magnification, and you’ll definitely be impressed by the long-distance resolution. It’s possible to focus in on items that over a mile away, still seeing excellent detail in shadow. 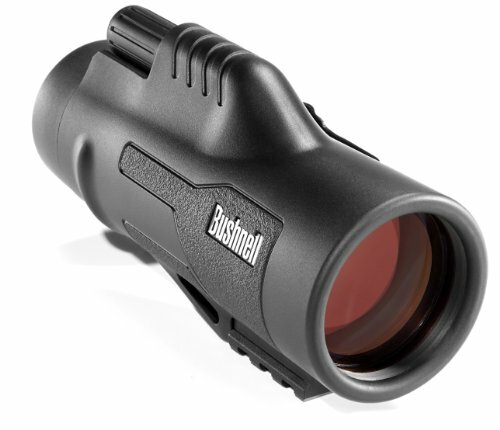 This makes the Bushnell monocular ideal for use on a hunt, while wildlife spotting or even while looking at the stars! The Bushnell Legend Ultra HD monocular features Bak-4 roof prisms to ensure outstanding optical clarity. The lenses are also multi-coated to guard against glare and fogging. Thanks to the proprietary RainGuard HD coating from Bushnell, the lenses work perfectly even in inclement weather since water is repelled from the lens and moisture from sleet, snow or rain beads up to scatter considerably less light for a bright and clear view even in dire weather conditions. Not only that, but the ED Prime glass will help to reduce any color dispersion, so even at a long range you can make out impressive color detail. At 15.2mm the eye relief is very comfortable and you can twist up the eyecup to accommodate your glasses if necessary. The close range of focus is right up to 6.5 feet while the objective 42mm lens ensures ample light transmission making this the perfect monocular to use in both low light or daylight conditions. Recommended Reading: Does this monocular make our list of the best? Find out here. As you might expect by now, the FoV on the Bushnell monocular won’t disappoint. You’ll get 340 feet of view even from 1000 yards, and this is well above average for a 10x model. You’ll easily be able to adjust the focus wheel single handed thanks to its handy location on top of the monocular itself and since it spins with optimal resistance, you’ll easily be able to focus without any concerns about accidentally going off-focus. The Bushnell Legend Ultra HD monocular comes in a choice of two colors – tactical sand and matte black. The rubber armored body ensures ample protection from accidental grinds and bumps and the texture has been perfectly located on the body to allow you to have a slip-free and secure grip. The belt clip is made from strong stainless steel for excellent durability while the Picatinny rail allows you to mount a range of accessories such as a flashlight. The nitrogen purged barrel will also guard against fogging. As an added advantage, the Bushnell monocular is well protected by the manufacturer’s 100% satisfaction money back guarantee so you can be confident that, should you be unhappy with your purchase for any reason, you’ll get all of your money back no questions asked. No matter how good a monocular might look, all that really counts is how well it can perform when out in the field. However, there’s nothing to worry about when you choose the Bushnell Legend Ultra HD Monocular. It offers an outstanding level of performance whether you’re using it on a hunting trip, to view wildlife while on a hike or even while stargazing. 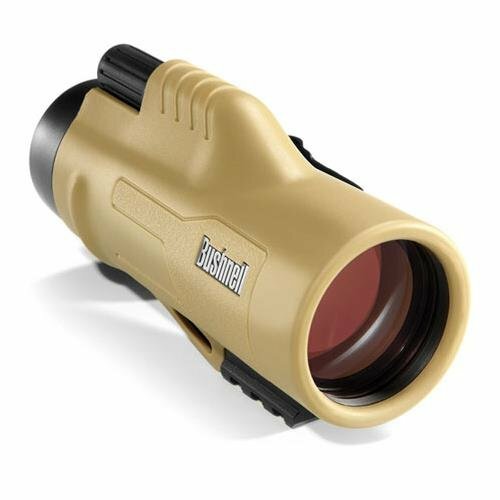 With the excellent level of definition that it can provide, even in poor lighting conditions, the Bushnell monocular represents great value for money all around. Small and light enough to carry anywhere, and coming complete with everything you need to get started right out of the box, this monocular is a recommended choice for anyone who enjoys the outdoor lifestyle. The inclusive belt clip, carrying strap and carry case makes it a breeze to carry and store this handy gadget and since it’s also backed up by the manufacturer’s no quibble warranty, you’ve got complete peace of mind that your purchase will be well protected in the unlikely event that something goes wrong. Even better, this monocular comes in at a surprisingly affordable price, so you can enjoy outstanding value that will really improve your outdoor lifestyle for many years to come.